The best first: Did you hear the joke about the elephant in the elevator? No? Me neither, I took the stairs. Son: I’m really sorry I did it, dad. 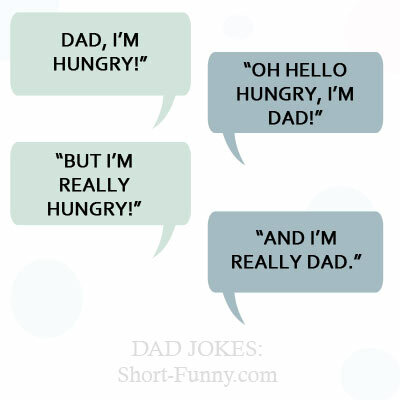 Dad: Well, son, you know that now I must pun-ish you. Dad, looking at soy milk: “Holá, milk, soy dad. Father: Do you know the joke from the 3rd floor? Father: Me neither, I was on the 2nd floor at the time. Do you have a hole in your shoe? What do you mean, no? How did you get your foot in then?" Hey dad how was your weekend?" - "Light, dark, light, dark, Monday." Dad to his son: "I like you. You remind me of myself when I was young and dumb. "Daughter to her dad: "What is it?" Dad: “It” is a pronoun. Dad: “Ohhhhh and I wondered what that high-pitched grinding sound was!”How many pears grow on a tree? They all do. Officer, I’m calling to report my children. They refuse to go to bed. They are resisting a rest. Dad to his daughter: "Never forget, sweetie, you're unique, like everyone else." Dad, can I leave the table please? Sure, as long as you leave it right where it is.